sorry but i can't allow this blasphemy to go unchecked... cap would DESTROY Supes if DC wasnt so worried about Cap outshining Supes. 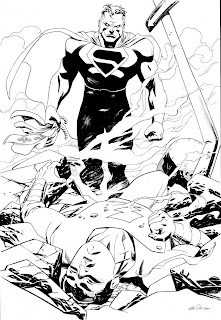 I'd kinda have to agree, but this was a case where I got a commission of Superman whoopin' Cap the SAME week as Comic Twart/Superman. If it were completely up to me I'd have drawn Superman the way GOD intended him to look. Actually I'd have loved to see you draw that guy. Sorry folks, that's exactly how it would go down. I'm sure that would be up for debate, but still, this is great piece.